The European economy has started 2019 in the doldrums. Italy has slipped into a technical recession having recorded two consecutive quarters of GDP contraction. Germany’s growth went negative in December and we’ll find out later this week if it, too, is bound for the same fate. Things aren’t looking much better in France either, as political protestors continue to prove a drag on business investment and economic growth. There’s the small issue of Brexit, too. But, European equity fund managers are not worried. While risk-averse asset allocators are running for cover, stock pickers have been finding bargains. Carlos Moreno and Thomas Brown, managers of the Miton European Opportunities fund, are looking through the macro headwinds and focusing on the quality companies found on the Continent. The pair look for profitable companies whose sectors have big barriers to entry for challenger players. They also must be willing to invest their earnings in their future growth. Valuation comes last. “I believe that if you buy nothing else but 50 high-quality businesses you’ll outperform over time,” says Moreno. Macro factors just don’t come into the fund’s process. “We’re not traders and we’re not economic people. We are just pure bottom-up stock pickers. That means traipsing around Europe on easyJet flights looking for businesses you think are going to be a lot bigger in the future,” he explains. Moreno talks Morningstar.co.uk through three of his portfolio holdings below. As part of the fund’s approach of going wherever the opportunities are, the biggest country weighting is towards Italy. Despite the ongoing political uncertainties and technical recession the country is in, its equity market, like the UK, is not a play on the economy. 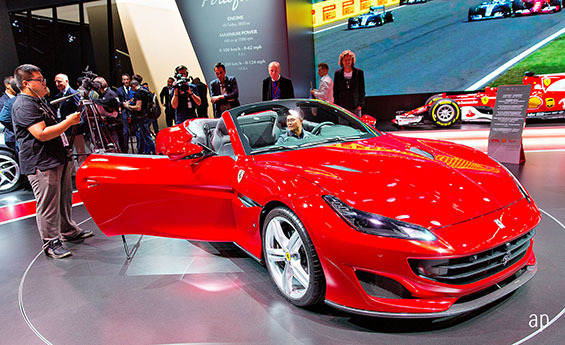 Ferrari is the largest stock in the portfolio. The autos sector has had its own fair share of problems, too. New emissions standards are proving tricky for many, while the spectre of autonomous driving and electric vehicles looms meaning established, legacy players need to increasingly move with the times. Moreno notes that Ferrari is increasingly seen as a luxury good, so sector-specific woes do not trouble it as much. The firm continues to roll out new models and the manager expects them to sell a lot more cars in the future at higher average selling prices. “That will be tremendous for their P&L,” he says. There’s a bit of a turnaround going on here, as well. Having been spun off from Fiat Group, where it was “hidden” for years, “it’s finally being managed to maximise its potential”. While the electric vehicle future is a question mark – “the challenge for Ferrari that I’m always very aware of, is the ability to build a premium electric vehicle – there’s another leg to the story. After a period of weakness, shares have recovered from their early January lows of €85 to €109. The newest addition to the portfolio has been Dutch chipmaker ASML. With chips becoming ever more in-demand, the stock has performed incredibly well, more than doubling in the three years to mid-July 2018 to an all-time high of €188. Since then, though, worries over supply chains for semiconductor firms, mainly in China, sent the stock down almost a third to a 16-month low €130 in December. “We felt it was a once-in-a-multiple-year opportunity to pick up some shares in ASML,” says Moreno. The stock has rallied 20% since, but still remains around 16% off its peak at €158 today. The machines it sells continue to get more and more expensive – by a factor between generations – and companies must buy from ASML because they are the best in the business, he adds. Electronic commerce continues to be a big growth area, with many online sellers and delivery hubs increasingly taking market share away from the malls and bricks and mortar players. But it’s still an unprofitable business and it’s hard, away from Amazon, to find the obvious winners. However, it has given fund managers reason to get excited in other related areas. Logistics is one of those areas. While Amazon has its own courier service, rivals generally lack the scope to deliver this themselves. Therefore, they need to build a vast network around them to fulfil orders. Swiss industrial manufacturer Interroll supplies products, including rollers, conveyors and pallet flow solutions, for courier and postal services, food distributors and many more areas. Examples of companies that use its wares include Amazon itself, Coca-Cola, Walmart and DHL. While it’s been around for a long time, the stock has come into its own in recent years, more than doubling on a 36-month view. Again, after a sharp pullback in December – it was down a third from August peak – it’s recovered to CHF1,762 today.